The other day my brother called me from his cell phone. Of course receiving his call from a cell phone is not really a big event. It happens all the time. Fifteen years ago it might have been a big deal. He probably would have been calling me to say “Dude, I’m calling you from a cell phone.” It would have been a big event because airtime was fairly expensive 15 years ago and mobile phones were mostly reserved for people driving BMW’s. Today, a cellular call from my brother is about as exciting as watching the traffic crawl along outside of my office window. But this wasn’t a typical cellular call. This call was transmitted from an iphone to my computer via Google talk. 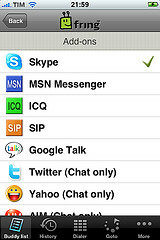 Among other things, Fring allows you to use your iphone to make calls to your instant messaging friends using an instant messager like Google Talk. Your data connection transports your voice over the internet. Thus, Fring allows you to talk all day long without using minutes from your call plan. Skype offers a similar service for Windows mobile devices. Fifteen years from now, I might think a VOIP conversation that originates on a mobile phone is mundane. Today, I am intrigued by the success of Fring despite a business model that competes with the mobile carriers that supply the bandwidth that on which Fring depends. If a startup like Fring can deploy its service without a partnership with mobile carriers, why can’t banks do the same? Do banks really need carrier cooperation to roll out mobile NFC payments? As I mentioned in a previous posting, smart phones, cheap data plans, and mobile market places are enablers that make it much easier to offer mobile services without carrier cooperation. Fring is a terrific example of those enablers in action. Banks may not even need device manufacturer support. A Hong Kong company is set to produce an NFC device (e.g. a sticker), that communicates with the handset via bluetooth. Thus, users can turn their phones into a smart electronic ticket, rewards card, or payment device without buying a new phone or waiting for manufacturers to include NFC support in their next handset. So it seems the chicken and egg problem has been solved. We have some eggs. Now it is up to financial institutions to start making them hatch.